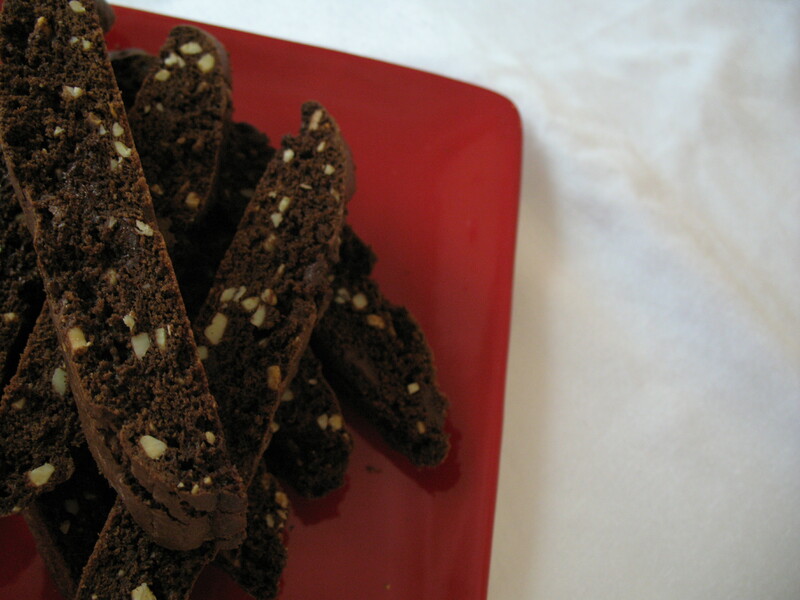 I think I like biscotti because they are the perfect non-cookie bakedgood for the non-baker. They are very forgiving: an extra 30 seconds or a minute mixing here or there won’t destroy the texture. The dough is easy to work with and doesn’t require trips to and from the fridge before baking. Biscotti are also almost infinitely variable. Once you have a basic recipe down you can create variation after variation on the biscotti theme. And finally, biscotti keep well. Store them in an airtight container at room temperature for two weeks or so, or wrapped in foil and then slipped in plastic bags in the freezer for a month. Because they are so easy and flexible, biscotti are a great addition to any gathering menu and you’ll find them on almost all of mine. I’ve added cherries because, well, what’s better than chocolate and cherries? I’ve doubled the recipe to make enough for two small offices and one fourth grade classroom. This recipe bakes a bunch o’ biscotti. My heavy-duty Kitchen Aid mixer barely manages to get the mix-ins into the stiff dough. If you are making this with a hand-held mixer or in a small mixer, consider making two separate batches that use exactly half of the ingredients for each batch. Speaking of smaller batches, if you don’t really need to feed two offices and a bunch of fourth graders, you can cut this recipe in half and make about 30 or so biscotti. The chocolate chip, cherry, and almond mix-ins total 3 ½ cups of goodness. Feel free to tweak the ratios of these ingredients or only use two of the three. You can also substitute another dried fruit like cranberries or blueberries for the cherries and the nut of your choice for the almonds. 1 1/2 cups bittersweet chocolate chips, roughly chopped. Butter and flour two large baking sheets or line with silpats. 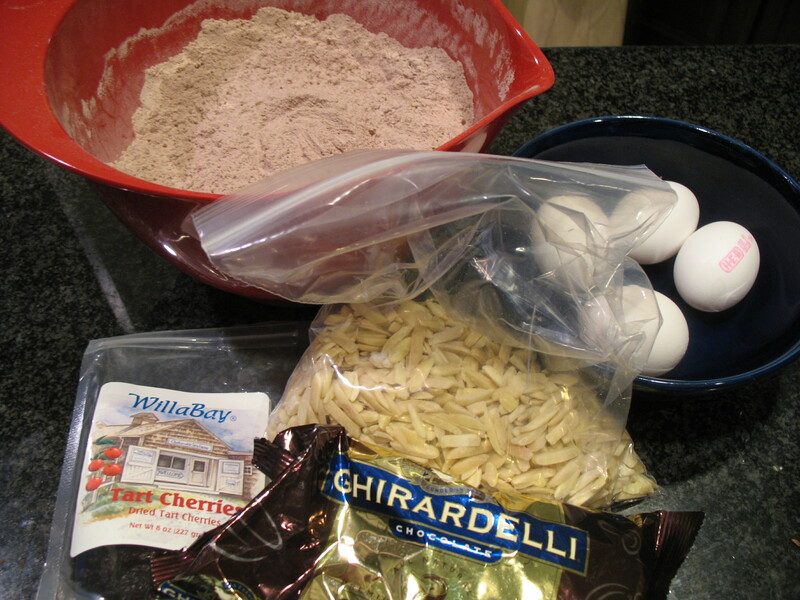 Whisk together flour, cocoa powder, baking soda, salt, and espresso powder in a large bowl. In an electric mixer beat together butter and granulated sugar until light and fluffy, 3 to 5 minutes. Add eggs, vanilla, and cherry extract. Beat until well combined. Incorporate the flour mixture on cup at a time to form a stiff dough. Turn the mixer on the lowest setting and add the almonds, cherries, and chocolate chips. Mix just until combined. Turn the dough out onto wax paper on the counter and divide into four equal parts. Flour your hands work directly on one of the prepared baking sheets. Form two sections of dough into two slightly flattened logs, each about 12 inches long and 2 inches wide. Repeat with the other two logs on the second prepared baking sheet. Bake logs for 35 minutes, or until slightly firm to the touch. 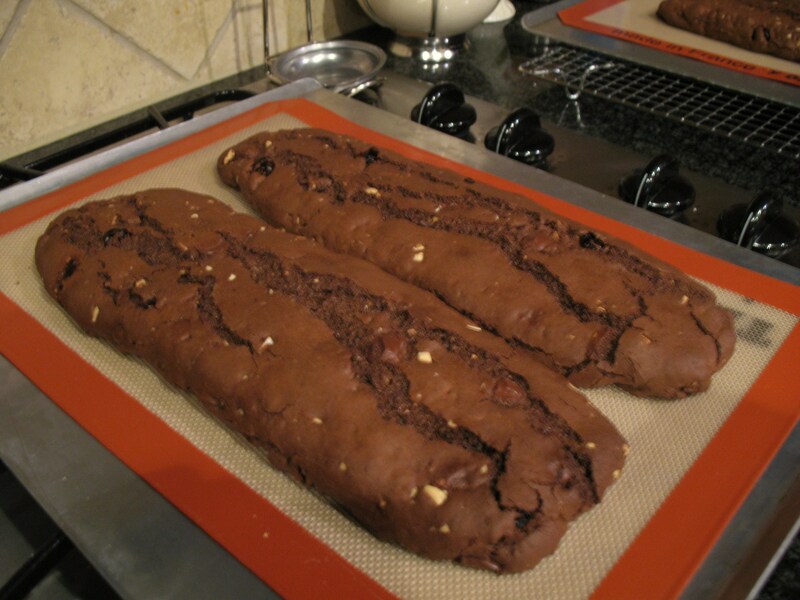 Cool biscotti logs on the baking sheets for 5 minutes and then transfer to a cutting board. Cut biscotti logs diagonally into 3/4-inch slices. 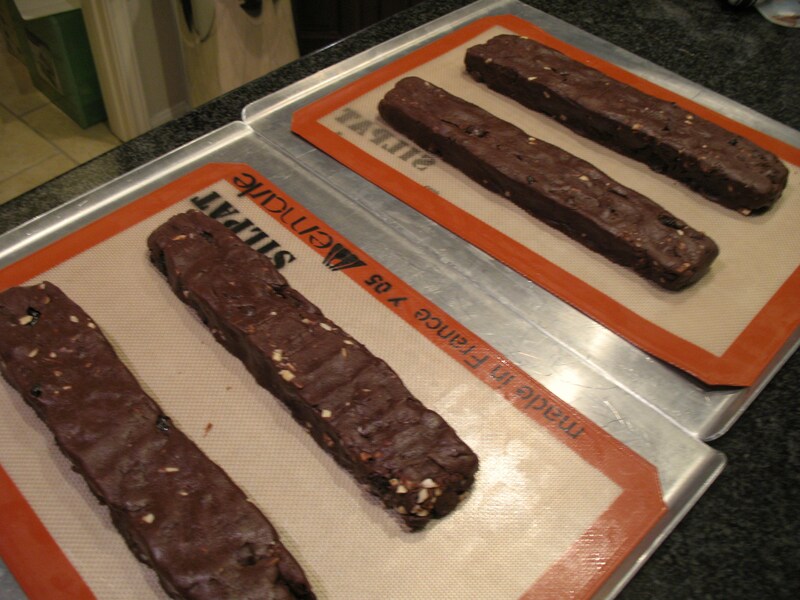 Remove silpats from baking sheets (if using) and stand individual biscotti slices on their bottoms on sheets. The biscotti from two logs should fit on one baking sheet. Return the baking sheets to the oven and bake biscotti until crisp, about 5-10 minutes. Remove sheets from oven and let biscotti sit on baking sheets for about 5 minutes. Transfer biscotti to a rack and cool completely. The biscotti will keep in airtight containers for 1-2 weeks and frozen up to 1 month.